Intellectual, provocateur, author, teacher, communist: Enzo Mari (born 1932, lives in Milan) is a designer, but above all a passionate artist and theorist. And a rationalist at the same time: He famously defined his work as being “elaborated or constructed in a way that corresponds entirely to the purpose or function”. 1952 to 1956 he studied classics and literature at the Academia di Brera in Milan, opened a studio in Milan and started work, besides continuing his studies of the psychology of visual perception. 1957 he created a first project for Danese: „16 Animali“, an ingenious wooden puzzle of animal shapes – that join together to form a rectangle. He worked for italian companies like Danese, Gavina, Artemide, Olivetti and Castelli, published numerous books on design topics and taught at universities and academies (including an honorary professorship in design at the Hochschule für bildende Künste Hamburg). In 1968 he participated in the 4th documenta in Kassel. In 1974 he published his book „Autoprogettazione?“, showing 19 furniture designs to be easily constructed just with simple tools. Seen as an alternative to capitalist dogma and contribution to the democratization of design, he could be considered a father of the „Do it yourself“- movement. Mari often infused his low-cost designs with multiple functions and customization features, meant to engage and empower the user. In 1971 he had applied this philosophy to construct his very first chair. 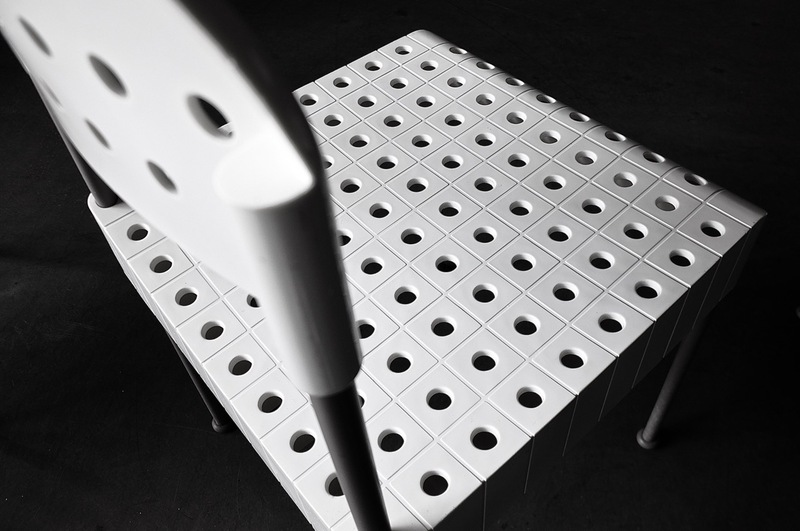 The Box chair for furniture company Castelli is a self-assembly chair consisting of an injection-moulded polypropylene seat and a collapsible tubular metal frame which comes apart to fit into a box – the flatpack chair was born. A revolutionary idea at that time, the box chair is a worthy exhibition piece in the Museum of Modern Art, New York. At func. we present a white 4-piece-set of Enzo Mari’s Box Chair in overall good condition.